Graham McNeill has written more Horus Heresy novels than any other Black Library author! His canon of work includes Vengeful Spirit and his New York Times bestsellers A Thousand Sons and the novella The Reflection Crack’d, which featured in The Primarchs anthology. 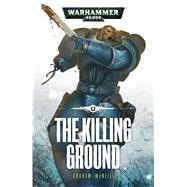 Graham’s Ultramarines series, featuring Captain Uriel Ventris, is now six novels long, and has close links to his Iron Warriors stories, the novel Storm of Iron being a perennial favourite with Black Library fans. He has also written a Mars trilogy, featuring the Adeptus Mechanicus. For Warhammer, he has written the Time of Legends trilogy The Legend of Sigmar, the second volume of which won the 2010 David Gemmell Legend Award, and the anthology Elves. Originally hailing from Scotland, Graham now lives and works in Nottingham.